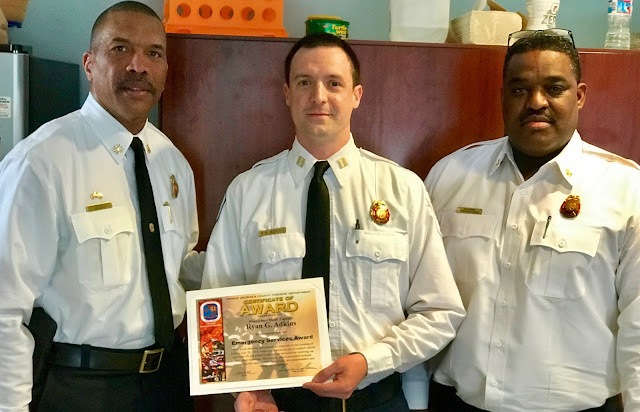 Fire Chief Benjamin Barksdale presented an Emergency Services Award and Meritorious Service Coin to Firefighter/Medic Captain Ryan G. Adkins for his actions keeping motorists safe. The award presentation was made at St. Josephs Fire/EMS Station in Springdale on Monday, March 25th. During the presentation Chief Barksdale stated, "I was notified by Assistant Fire Chief Darren Ware of your heroic actions that occurred on Friday, July 20, 2018, when you noticed a vehicle swerving in and out of the lanes on Route 50, nearly colliding with a bus. I am extremely proud of your selfless actions and sense of duty that prompted you to place your vehicle between the car and other motorists. I am most thankful that your actions were taken without any serious personal injury to yourself." Captain Adkins quick thinking and immediate actions on the scene of this incident, which possibly prevented loss of life and multiple serious injuries, are commendable and worthy of recognition. "You are hereby awarded a Fire/EMS Department Emergency Services Award. Your actions reflect well on you personally and professionally and exemplify the excellent caliber of service we strive to provide in every circumstance," concluded Barksdale.